The Apache and Comanche are the most well-known Native American tribes in Texas, but dozens more lived all over the region until the mid-1800s. They left behind thousands of arrowheads, which can still be found with a little effort. Dry creekbeds, riverbanks and freshly plowed fields in rural areas are prime hunting grounds. Heavy rains can dislodge formerly hidden arrowheads, so the odds of success improve after a big downpour. The arrowheads are fairly simple to identify with a little help from field guides and websites. If you’re still stumped, it’s easy to find experts who are eager to provide assistance. Determine the basic shape. Most Texas arrowheads fit into one of these 10 categories: articulate (fish-shaped), basal-notched (notches at the bottom), contracting stem (large triangle on top, smaller triangle at base), corner-notched (notches on bottom corners), lanceolate (long and thin without notches), leaf (wide in middle, narrow at the ends), side notched (notches on sides), expanding stem (beneath point, base is narrow then gets wider), stemmed (looks like a Christmas tree, including straight trunk) and triangle (basic triangle, no notches). Use a magnifying glass to spot notches, concave areas or other distinguishing characteristics. 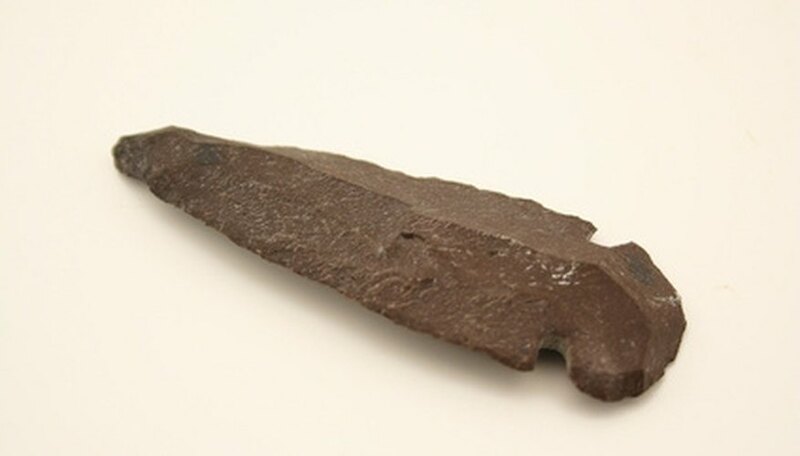 The various notches, grooves, indentations and protrusions offer clues about the surprising number of techniques developed by Native Americans to secure arrowheads. Note the color and texture of the stone. Most Texas arrowheads are made from flint, which can vary in color from dark brown to gray. Some are even translucent. Take multiple close-up photos against a contrasting background. Leave the arrowhead in place if you do not have permission to remove it (see Warnings section). Compare your photos to the photos and diagrams in the field guide. If the field guide doesn’t provide a positive identification, visit the websites listed in the resource section; they have thousands of arrowhead photos. If all else fails, there’s no substitute for a real live expert. The Texas Natural Science Center at the University of Texas in Austin periodically brings together scientists from several disciplines to help the general public identify artifacts. Bring your photos or the actual arrowheads. It’s illegal to collect arrowheads on public lands, including Texas state parks and national parks. Landowner permission is required to collect them on private land.